Don't eat these products—especially if you're pregnant. Looks like Trader Joe's is the latest popular food company to be affected by Listeria contamination. 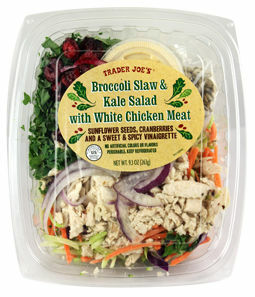 Ghiringhelli Specialty Foods, a California-based establishment has made the decision to recall 33,610 pounds of the grocery store's broccoli slaw and kale salad with white meat chicken, an item that may have been contaminated with Listeria, according to the U.S. Department of Agriculture's Food Safety and Inspection Service. The tainted products were produced between April 26 and May 1, with "use by" dates listed between May 2 and May 7. But that isn't the only item that's subject to recall. It might be wise to avoid the sunflower seeds, cranberries and sweet and spicy vinaigrette sold by Trader Joe's as well, as these items may also be contaminated. The items in question were shipped to Trader Joe's distributors in Arizona, California, Nevada and Utah. There have been no confirmed illnesses related to the consumption of these products but it's definitely a good idea to steer clear, especially if you're pregnant. Listeriosis can have truly scary consequences—pregnant women are 20 times more susceptible to the illness, which can be fatal. If you worry that you've ingested one of these products already, get in touch with your doctor, and if you've purchased any of these items, get rid of them and scrub down any surfaces they may have touched for good measure.